Please pray for my family as there are some trials that we need to overcome. Please pray that God will cover us with His blanket of protection. Please pray for peace and wisdom. We thank you that your Word promises us authority to trample on snakes and scorpions and to overcome all the power of the enemy. We pray that you would help us fully understand how to wield the authority you have given us so that we can defeat the enemy who has come to steal, kill, and destroy in our lives (John 10:10). We thank you that as you teach us to overcome, that nothing will harm us. Lord, we ask that you would protect each and every member of our family as well as those who pray for us. We thank you for your promise in Psalm 91 which says, “I will rescue those who love me. I will protect those who trust in my name. When they call on me, I will answer; I will be with them in trouble. I will rescue them and honor them (NLT).” Father, we thank you that in every circumstance we face, we can trust in you to protect us, and that you give us the authority to overcome. Although it is sometimes a long, difficult process, we are grateful knowing that you will bring us to a place of victory and peace. Well, I had a big update all typed up and when I went to post it the site had times out!!! Sorry, I don't have the energy to redo it but I will shorten it up for you! This year has been great! Lots of change for the better, tons of healing and restored hope! 2009 is going to be a GREAT year!! We have some big stuff ahead and Gods hand is in all of it!!! Sensory learning is going well! Makenzie was very emotional today which is great! It is suggesting the therapy is working!! She had a hard time of it the first day! She cried the whole way there and back. (2 hours) I almost threw in the towel! I am glad I didn't day 2 and 3 went much better with no tears! Next week we are back to therapy! No school because of the Sensory learning but that will be done next Sat. I am sure she will be excited to be back to normal life! I know I can't wait!!!!! We brought in the new year in style! We spent it with some very special family and friends. We talked and laughed, played games, and cheered the new year in! After the ball dropped everyone there laid their hands on Makenzie and prayed for her! I got to meet a very special young man named Josh. Several years ago on New Years Eve he almost lost his life! He was also deprived of oxygen. He shared with me what it was like to almost die and how peaceful heaven is! WOW!!! God sent Joshua back to earth from His throne surrounded by Angles because He was not done with this amazing soul!!! It was the most perfect way to bring in the New Year! God is here and will continue to carry us through all of the good and bad times of 2009!!! Thank you all for hanging in there with all of us this year!!! 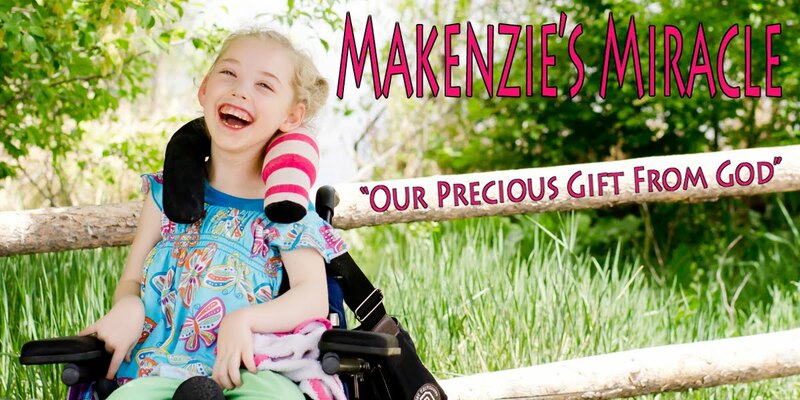 Keep praying for Makenzie! This year is going to be amazing!!!! God Bless you all in 2009!